Like the empire upon which it depended, the multi-ethnic diocese in America collapsed as a direct result of the 1917 Bolshevik Revolution in Russia. From the ruins would emerge ten independent, and often antagonistic, ethnically-based “jurisdictions”: three Russian, two Arab, as well as Serbian, Albanian, Romanian, Ukrainian, and Carpatho-Russian bodies. Ironically, even as the American diocese was disintegrating, the independent Greek parishes in America were attempting to unite. These events, coupled with the passage of the racist National Origins Quota Act of 1924, which in effect closed America to all further immigration but that from Northern Europe, mark the end to an emerging “Immigrant Church,” and the beginning of a new, complicated, and confusing era of “ethnic churches” for Orthodox Christians in North America. St. Tikhon, Patriarch of the Russian Orthodox Church, under house arrest. In February 1917, the Russian Tsar Nicholas II abdicated. The Russian Orthodox Church seized the opportunity to initiate internal reforms it had sought since 1905. An “All-Russian” Church Council, composed of clergy and laity, began deliberations in Moscow in August 1917. The North American diocese, still an official part of the Russian Church, sent its leader, Archbishop Evdokim (Mischersky), and two clergy delegates, Frs Alexander Kukulevsky and Leonid Turkevich. The archbishop appointed one of his auxiliaries, Alexander (Nemolovsky), the Bishop of Canada, to administer the American diocese during what he believed would be a short absence. In fact, Evdokim was never to return to North America. As the Church Council continued to meet in Moscow, the Bolsheviks seized power in the capital, Petrograd (St. Petersburg), on October 25, 1917. Ten days later, the Council chose Tikhon, former head of the American diocese (1898-1907), to be the new Patriarch of All Russia. Under the watchful eyes of unsympathetic Bolshevik guards, thousands of Orthodox believers crowded into the Kremlin’s Dormition Cathedral to celebrate Tikhon’s enthronement. Newly elected Patriarch Tikhon presides at “All-Russian” Church Council in Moscow, 1917. Throughout the next seventy years (1917-1989), the atheistic Bolsheviks would wage a relentless war against the Church. The Russian Orthodox Church was legally dissolved, and a radical, Soviet-controlled movement called “The Living Church” was established in its place. All Church properties and assets, including icons, were confiscated by the new Soviet government. Four-fifths of the Bishops attending the “All-Russian Council” would be executed, die in prison, or be forced into permanent exile. More than 12,000 clergy would be murdered, more than 100,000 Orthodox Christian lay leaders killed. The majority were shot; some were beaten; more were hanged; others were drowned. By 1939, the number of Orthodox parish churches in Russia had been forcibly reduced from 54,000 to less than 100. The few that remained were used as “show” churches, as proof of “religious freedom” in the new Soviet Union. All 1,500 Orthodox monasteries and convents were disbanded; the monks and nuns, dispersed. All 61 seminaries were closed. The Church was forbidden to publish or distribute Christian literature, to operate religious schools, or to engage in any charitable work. It was a persecution of Christians unparalleled since the days of ancient Rome. The first clerical victim of Soviet anti-Orthodox violence was Fr John Kochurov, a former Orthodox missionary to the United States (1895-1907). Kochurov, founder of the Orthodox parishes in Madison, Wisconsin, and Joliet, Illinois, had returned to Russia to serve a parish in St Petersburg. On October 31/November 13, 1917, Fr John was shot to death by Bolshevik forces who had just taken over Tsarskoe Selo. Fr Kochurov, together with Fr. Alexander Hotovitzky, was glorified as a saint by the Russian Orthodox Church in December 1994, with Metropolitan Theodosius, Primate of the Orthodox Church in America, participating in the ceremonies. As early as March 1917, Russian monies for the support of the North American diocese were cut off. Inspired by the revolutionary changes in Russia, a group of “progressive” priests, led by Fr John Kedrovsky, sought to depose Bishop Alexander (Nemolovsky) and to reorganize Orthodox church life in America “without reference to royal regimes or (episcopal) decrees.” Revolutionary fervor spread among the laity as well. The American Socialist Party began to offer political and anti-religious lectures in Russian-American communities concurrently with church services. One parish priest lamented in the winter of 1918 that of his 1,000 Russian parishioners, barely 100 still attended services. Revolutionary fervor was matched, if not surpassed, by resurgent ethnic nationalism. In the words of Bishop Aftimios (Ofiesh): “The World War, and the triumph of the slogans of ‘democracy’ and ‘self-determination’ fanned into a destructive flame that is smoldering but ever superabundant nationalism in the Eastern Orthodox people (in America.) ... Each little group or tribe now aspired to become a distinct nation..” The earlier, unifying ideology of pan-Slavism faded as ethnic Carpatho-Russians began to distance themselves from ethnic Russians, and nationalist Ukrainians from both. Faced with clerical and lay dissidents, political and nationalist agitation, bereft of funds, and facing a mounting debt, Bishop Alexander began to mortgage parish properties to pay the diocese’s creditors. Ultimately, the embattled Alexander was forced to resign in 1922 in favor of Metropolitan Platon (Rozhdestvensky), the former head of the American diocese (1907-1914), who had recently returned to the United States as a refugee fleeing the Communists. As Russian leadership foundered, nationalist passions spread among the non-Russian parishes of the American diocese. 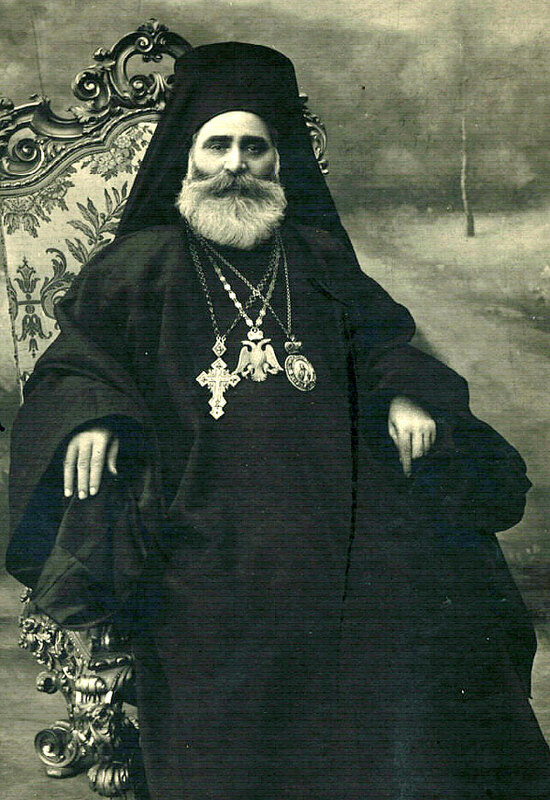 Bishop Aftimios (Ofiesh) bitterly reflected that ...discipline, order, and unity became most difficult to preserve. Each little group of Orthodox people produced some new party or leader who wished to set up in America a Church based solely on the national or racial derivation of its adherents. The unity of Orthodoxy in America, regardless of nationality or language, was forgotten in this sudden over-emphasis upon political or tribal distinctions based upon the reorganization of the map of Europe. The true ideal of the one Orthodox Church in America for the growing thousands of Americans born and reared in Orthodoxy was lost in the over-zealous patriotic desire of the immigrant generation to parallel in America the national resurrections taking place in Europe. The situation was most favorable to ambitious and self-seeking ecclesiastical adventurers and politicians; and these appeared in every group. In the brief span of four years (1917-1921), forty years of progressive Orthodox church life in America disintegrated. As Russia collapsed into political chaos, so too did Greece. In 1917 the pro-German King Constantine was forced into exile by his pro-Allied Prime Minister Eleftherios Venizelos. Venizelos subsequently designated his nephew, Meletios Metaxakis, as Archbishop of Athens and the head of the Orthodox Church of Greece. Metaxakis was one of the most fascinating characters in Orthodox church history. He was the only man successively to lead four autocephalous (independent) Orthodox Churches: those of Cyprus, Greece, Constantinople (Turkey), and Alexandria (Egypt). On the basis of a 1908 decree of the Ecumenical Patriarch that the independent “trustee” Greek parishes in America should receive episcopal oversight from the Church of Greece, Metaxakis journeyed to America in the summer of 1918 to survey the situation. Three months later he returned to Greece and appointed Bishop Alexander of Rodostolou as his resident American legate. Alexander was charged with the unenviable task of initiating canonical order among the independent Greek parishes throughout North America. In the Greek elections of 1920, however, Venizelos was defeated. The king returned to power, and Metaxakis was deposed as Archbishop of Athens. Like so many other political refugees, Metaxakis fled to the United States. Still recognized as the legitimate head of the Church of Greece by his American legate, Bishop Alexander, Metaxakis presided over the organization of some Greek parishes in North America into a formal “Greek Archdiocese” on September 15, 1921. 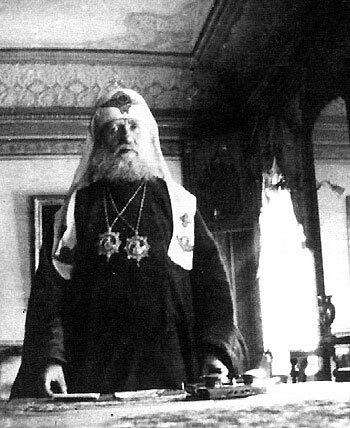 In yet another surprising reversal of fortune, the exiled Metaxakis was elected Ecumenical Patriarch only two months later (November 25, 1921). Meletios, however, was not about to give up his American creation. In one of his first acts as patriarch, Metaxakis repealed the 1908 Tomos, in effect transferring jurisdiction of the new Greek Archdiocese from himself (as Archbishop of Athens) to himself (as the Ecumenical Patriarch). Metaxakis justified the move by reference to canon 28 of the Council of Chalcedon (AD 451), which he claimed granted the Ecumenical Patriarchate jurisdiction over Orthodox Christians in all “barbarian lands.” Metaxakis appointed his old friend Bishop Alexander to lead the new archdiocese. Unfortunately, the hopes of the immigrant Greek community that their long canonical disorder in America would be settled were not realized. The royalists in Greece rejected both the creation and subsequent separation of a “Venizelist” Archdiocese in America. Metropolitan Germanos (Troianos), a royalist partisan, was sent from Greece to challenge Alexander for control of the new archdiocese. Spurred on by the two New York Greek language dailies, the royalist Atlantis, and the Venizelist National Herald, the fledgling Greek Archdiocese rapidly disintegrated into violently opposed factions. It would remain bitterly divided for almost a decade (1922-1931). As late as 1918 the missionary diocese still sought to defend its canonical rights over the Orthodox community in North America. A formal protest to the Patriarchate of Antioch in that same year ended in the attempt of Metropolitan Germanos (Shehadi) to woo Arab parishes in the American diocese away into an “Arab Church.” The Third “All-American Council” in 1919 tried desperately to maintain canonical unity in an increasingly polarized ethnic situation by electing Archimandrite Mardary (Uskokovich), a Serb, and Fr Fan Noli, an Albanian, to be bishops of the Serbian Administration and Albanian Mission respectively. The Council respected the wish of its Canadian parishes to be known henceforth under the name of the “Ukrainian Orthodox Church.” By 1922, however, circumstances and necessity forced the missionary diocese to abandon these efforts at maintaining any semblance of unity. In 1922, a substantial number of Carpatho-Russian parishes, led by a disaffected auxiliary bishop, Bishop Stephen (Dzubay), unilaterally withdrew from the American diocese and formed their own nationalist jurisdiction. Given this internal turmoil, the American diocese largely ignored the creation of the Greek Archdiocese; nor were protests made when the Bulgarians erected their own jurisdiction under the Church in Bulgaria later that same year. In short, the beleaguered multi-ethnic American diocese was so preoccupied with its internal difficulties that it tacitly accepted devolution of the Orthodox community in North America into a patchwork of ethnic jurisdictions. Soon thereafter, the American diocese’s own Ukrainian parishes in Canada joined a schismatic nationalist Ukrainian church in exile (1924); the Serbian administration became part of the Serbian Church (1926); while the Albanians formed ties with Albania (1932). As a sign of the confusion of the times, the independent Romanians placed themselves under the temporary pastoral care of the Protestant Episcopal Church until relations with Romania could be regularized (1935). The “Syrians” divided into two groups. In 1924, a number of Arab parishes of the former American diocese were accepted into the jurisdiction of the Patriarchate of Antioch (Syria) through the efforts of Bishop Victor (Abu Assaly). The rest of the Arab parishes attempted to sustain a corporate existence without reference to an old-world Patriarchate by establishing an independent “American Orthodox Catholic Church” under their leader in the former American diocese, Bishop Aftimios (Ofiesh). Despite Ofiesh’s vision and leadership, the attempt lasted only six years (1927-1933). Disillusioned, Ofiesh resigned his episcopacy and married. The death of Abu-Assaly in 1934, a few months after Ofiesh’s resignation, seemed to offer an opportunity for the whole Arab Orthodox community to be reunited. Alas, the chance was lost. On the very same day, bishops from the old American diocese inexplicably consecrated bishops for each of the feuding Arab dioceses. Although both Arab groups, and both bishops, were ultimately accepted into the jurisdiction of the same Patriarchate of Antioch, the resultant Antiochian Archdiocese of New York and the Antiochian Diocese of Toledo remained administratively separate until 1975. 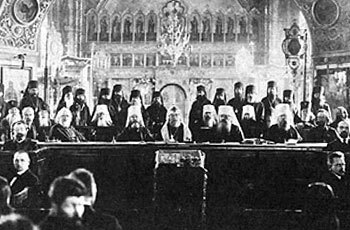 “Karlovtsy Synod” meeting in Yugoslavia, 1935. Seated (left to right): Metropolitans Theophilus and Anthony, Patriarch Varnava, Metropolitans Evlogy and Anastasy. Standing: Archbishops Theophan and Germogen, Bishop Dimitri. Resigning itself to ethnic devolution, the former multi-ethnic American diocese became known as the Russian “Metropolia,” after the title of its then current leader, Metropolitan Platon (Rozhdestvensky). Yet even this reduced position was challenged by groups both inside and outside of the Soviet Union. 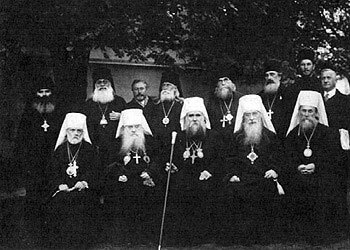 In 1921, a group of refugee Russian bishops meeting in Karlovtsy, Yugoslavia, organized the “Supreme Ecclesiastical Administration Outside of Russia.” The purpose of the “Karlovtsy Synod” (or, more commonly, “the Synod in Exile,” or “the Synod”) was to re-unite the scattered parts of the Russian Church in Europe, Asia, and North America. The Metropolia cooperated with the Karlovtsy Synod until 1926, when the Metropolia (as well as the Russian Archdiocese in Western Europe) withdrew support in protest against the Synod’s increasingly exaggerated claims of authority. A second uneasy period of cooperation began in 1935 and lasted to 1946. Forced to flee Yugoslavia by the advance of the Red Army in the latter days of World War II, the Karlovtsy Synod ultimately left Europe and re-established itself in New York City. The explicitly pro-monarchist Synod began to establish its own “Karlovtsy” parishes in the United States in open competition with the Metropolia. Unwilling to accept this uncanonical intrusion on its own territory, the Metropolia broke all relations with the “Synod” in 1946. Metropolitan Theophilus and Bishop Arseny at St. Tikhon’s Monastery in the early 1940’s. Two additional challenges came from inside the Soviet Union. Although the Communist-sanctioned “Living Church” (1922-1939) ultimately failed, it attracted many sincere bishops, priests, and laypeople to its schism. In fact, one of the leaders of the “Living Church” was a former head of the American diocese, Archbishop Evdokim, who had left America to attend the 1917 Church Council in Moscow. Nevertheless, it was the moribund Russian Orthodox Church, having accommodated itself politically and administratively to the Soviet government in 1927, that was to cause the most difficulties. Officially denouncing the Metropolia as “schismatic” in 1933, the Russian Orthodox Church, like the Karlovtsy Synod, began to organize Russian parishes throughout North America in 1946. 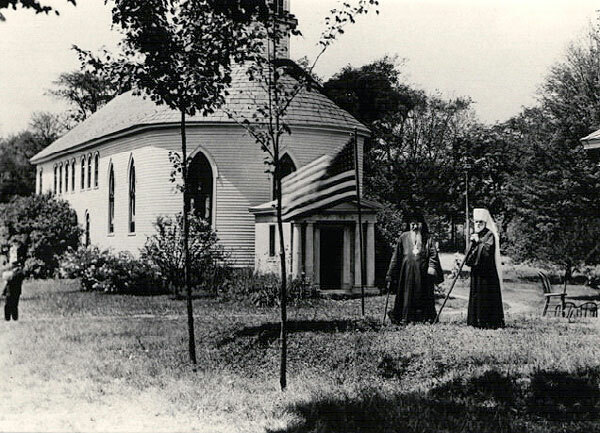 Although the overwhelming majority of Slavic parishes in the old American diocese remained loyal to the Metropolia, these attacks from the right and the left produced deep and lasting divisions within the Russian-American community.